Washington Elementary staff hold the Governor's Distinguished Improvement banner they were given by Colorado State Board of Education members. Last Wednesday a contingent of Washington Elementary School staff were invited to the Colorado Department of Education in Denver to accept a Governor's Distinguished Improvement Award. 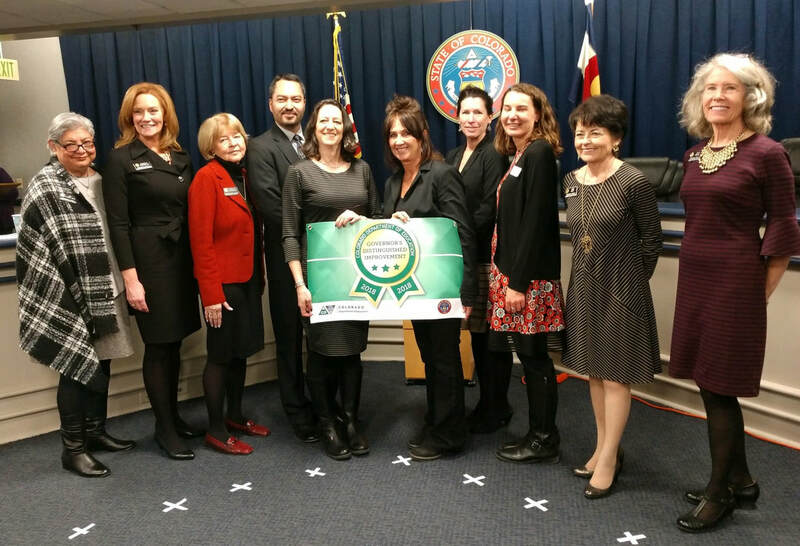 Distinguished Improvement Awards are bestowed on schools that demonstrate exceptional student growth through Colorado's statewide assessment system. These schools exceed expectations on the School Performance Framework indicator related to longitudinal academic growth, and they meet or exceed expectations on the indicator related to academic growth gaps. Washington earned this award on the strength of 4th and 5th-grade academic growth in Math at the 80th percentile and English Language Arts growth at the 56th percentile. There is no better way to exemplify our core belief valuing academic growth than to earn an award such as this. Congratulations Washington! 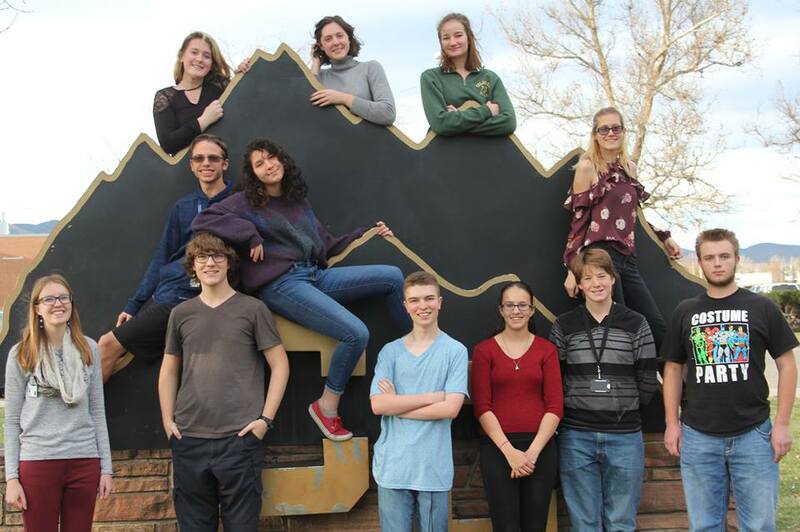 Congratulations are also due to the Cañon City High School Tiger Talkers debate team! Emily Reynolds qualified for the National Tournament in Congressional debate while Weston Niedens and Everette Jensen earned alternate positions in their events. As an aside, CCHS Principal Bill Summers was honored by being named Regional Administrator of the Year. This means he's in the running for the national award. Congratulations to all for taking risks to grow! The CCHS Tiger Talkers just wrapped up a great season by qualifying several individuals for Nationals. CCMS Principal Jesse Oliver discusses the class Learning Target with students during our building site visit. While the Washington staff was being honored in Denver last Wednesday I participated in the annual on-site building review at Cañon City Middle School with a team of five district representatives. While there we held deeply thoughtful discussions about how the year has gone, especially in light of this being the first year for Principal Jesse Oliver and Assistant Principal Russ Braiden in their roles. We also visited classrooms in three different shifts, then discussed the instruction we saw and addressed specific rubric items as a group. While in the school we saw many wonderful things including a distinct pride exhibited by all students and staff. Learning was clearly taking place in every classroom, and in nearly every class we entered we could find clearly posted learning targets. We also noted CCMS has some of the most engaging life-skills classes we have seen in the school district. We noticed teachers instructing vocabulary in context, saw Academic Enrichment classes being effectively instructed, and noted that many staff are embracing the iLearn blended learning training the district is offering, setting themselves up for success when devices are placed in the hands of kids next year. All the students we came in contact with were extremely respectful, and we observed the needs of special education students being met in regular classrooms in a seamless manner. As observers, we simply had no way of telling which students were in special education, and this was wonderful! Finally, we observed many pockets of extreme teaching creativity and, quite frankly, outstanding models of how to genuinely engage students in learning. Cañon City Middle School has shown tremendous academic gains in the past three years, and by all indications, the staff is fully sustaining its momentum. 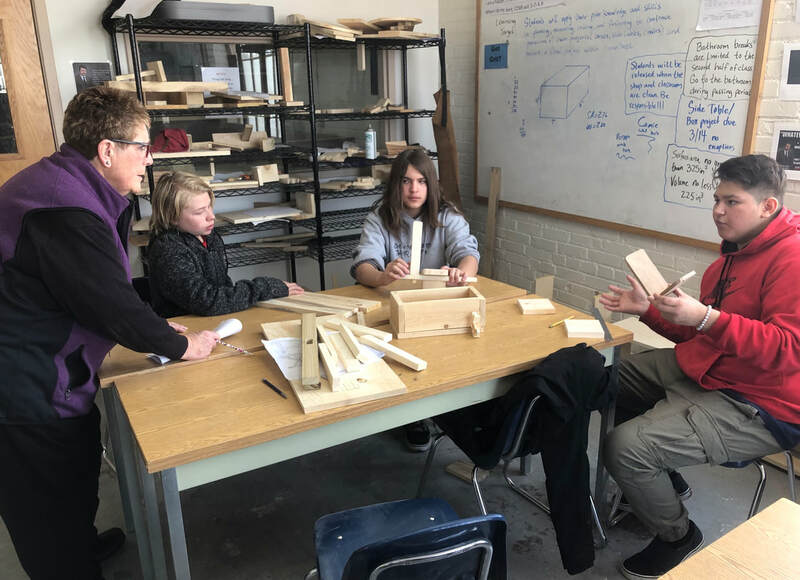 Board member Mary Kay Evans discusses the projects CCMS students were crafting their vocational building trades life-skills class. Brandy Price (and one of her classes). 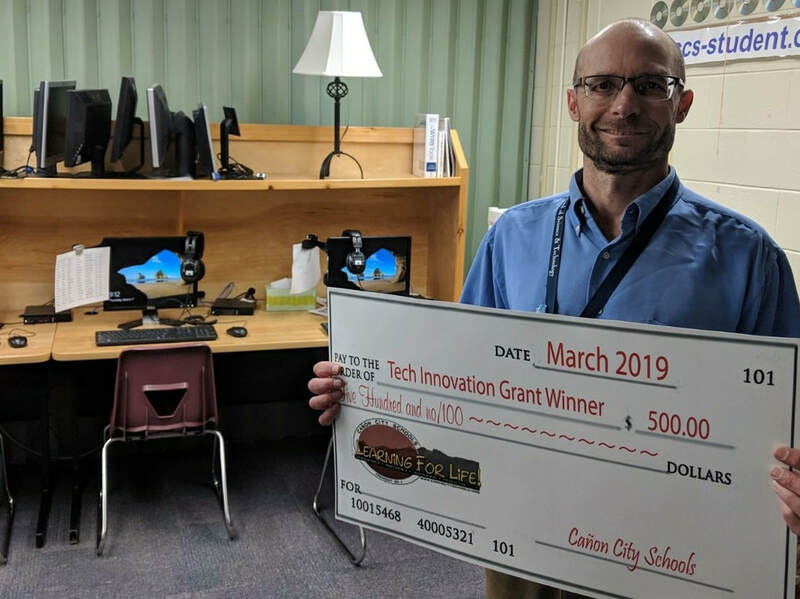 Last week Instructional Technology Coordinator Dan Coppa announced our first ever Cañon City School District Technology Innovation Grant winners! Cañon City Middle School Language Arts Teacher Brandy Price is a recipient who plans to pilot Newsela. Newsela is a cross-curricular instructional program that targets student need with individualized instruction, offering engaging, relevant material that can be differentiated for each student. Newslea provides material for all core content areas as well as social-emotional awareness. We look forward to hearing from Brandy about how this might apply to more students. Lincoln School of Science and Technology Tech Teacher Dwayne Walter will use his grant to purchase Snap Circuit electronics kits. These kits allow students to create automated solutions to problems by building electronic circuits without having to use solder. This is an excellent way for students to learn about design, how energy travels, electronics, mechanics, and coding. Snap Circuits simply snap together and then snap apart, so they can be used over and over. 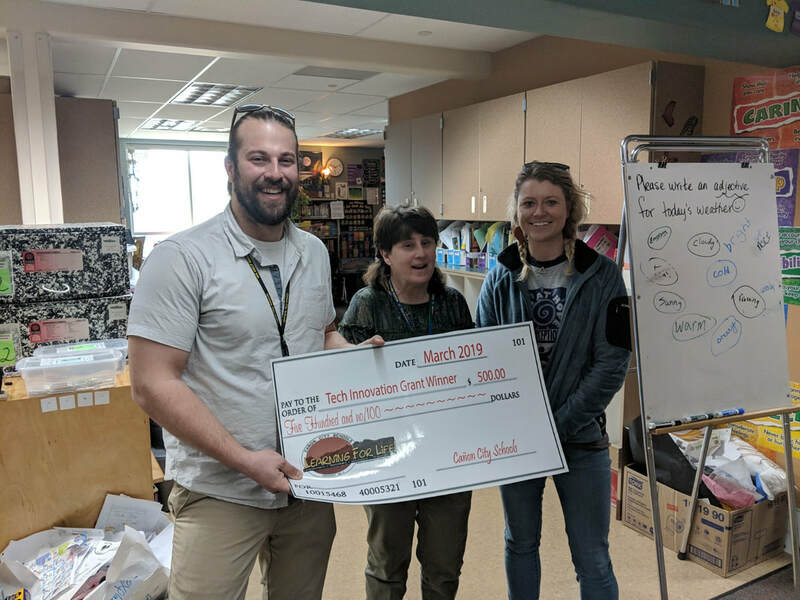 Mitch Ary and his Harrison School 5th-grade team will use their grant as an extension for creating digital stories based on student personal narratives, opinion, and argument essays. It will also allow for research and informative writing. They will do this by having students create digital stories using WeVideo. Congratulations to all, and thanks for going the extra mile by submitting your proposal! ​The Cañon City community will soon see fencing popping up around the Cañon City Middle School property as the GE Johnson Construction Company prepares to break ground on our major building upgrade. Work will first be tackled on the west side of the school facility, pretty much eliminating all current parking access to along 12th on that side of the school. Last week the CCMS Players presented "The History of dating." It was the last student play performance to take place in the old auditorium. Last week began with a snow day, during which I worked on annual building review paperwork. On Tuesday I appeared on KRLN's Morning Line, held a touching base meeting with Fremont County Communities that Care Coordinator Katie Romano, and guided a screening process of Lincoln School of Science and Technology principal candidates. On Wednesday we conducted our annual building review at Cañon City Middle School and held a CCEOE board meeting. On Thursday I prepared paperwork for Monday's board of education meeting, attended a Mountain View Core Knowledge School budget progress and development meeting, worked on building review reports, then attended a Mountain View Core Knowledge School middle school parents meeting to address questions about middle school athletic participation. On Friday I spent the entire day conducting Lincoln School of Science and Technology principal interviews. SRO Vidmar pitched in and read at Harrison's Dr. Seuss Night. We start the week at Washington Elementary to conduct an annual on-site review. Afterward, I'll attend a board work session and meeting, and hopefully, I'll make it to the Cañon City High School Choir spring recital before calling it a day. I start Tuesday in a touching base meeting with Director of Student Support Services Paula Buser, and then one with her and the Cañon City Police Department. We'll then hold our weekly Superintendent Advisory Council meeting, and I'll hold one of several expulsion follow-up meetings I have throughout the week. I'll then meet with Police Chief Daric Harvey about the future of our SRO program, followed by a Harrison leadership touching base meeting, a District Leadership Team meeting, a Communities That Care Key-Leader gathering, and finally a monthly touching base meeting with certified association leaders. Wednesday starts with a classified association touching base meeting, an all-day Lincoln School of Science and Technology building site visit, and a monthly Department of Human Services FIOG meeting. On Thursday I attend a Pikes Peak Education Association legislative phone conference, a student Chromebook repair program set-up meeting, and then we'll host our second Civic Canopy community engagement meeting. My plan for Friday is to spend the entire day working on building review written reports. 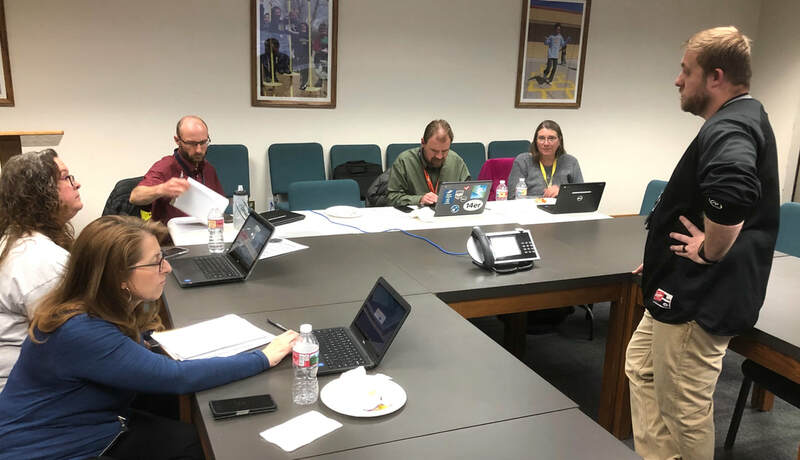 Our elementary tech leaders Annette Nimmo, Lisa Bryan, Dwayne Walter, Mark Lyons, and Karin Steadman work with Dan Coppa to plan our their important role as we work to put devices in the hands of all elementary students. Last week we received an email from our partners at Learning.com offering kudos to many of our staff members. I'd like to share it. Districts that partner with Learning.com all have one goal in common – to equip their students with the Digital Literacy skills needed to succeed in high school and beyond. I am pleased to recognize the following individuals as outstanding Digital Literacy Educators and for helping students throughout the district master their Digital Literacy skills: Lisa Bryan, Karin Steadman, Annette Nimmo, Dwayne Walter, and Mark Lyons. Working with a combined 1,558 students, and completing over 95,000 Learning.com lessons so far this year, these 5 educators are all currently in the top 1% of Learning.com educators in the world. Lisa, Karin, Annette, Dwayne, and Mark, thank you for your hard work and dedication to ensuring the students you work with are prepared for success in our digital world! Wow! Thank you, Lisa, Karin, Annette, Dwane, and Mark! What better way to model our value of risk-taking and to put our kids needs ahead of yours. Your hard work is already paying off for their benefit!